In the realm of Westeros, peaceful calm is a rare and treasured thing. Sometimes, it comes innocently, without demands or ulterior motives. Yet all too often, these brief moments of reflection are a cunning deception. They mask quiet political machinations, the stealthy movements of enemy armies, or a foe patiently waiting to strike. This is one such moment of calm, and you can set your own plots in motion with Calm over Westeros, now available at your local United States retailer and online through our webstore! 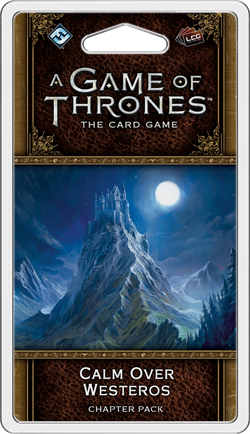 Move towards the Iron Throne or play out the iconic events of the first book in A Song of Ice and Fire with Calm over Westeros, the fifth Chapter Pack in the Westeros cycle for A Game of Thrones: The Card Game. Within this Chapter Pack, you’ll find sixty new cards (three copies each of twenty distinct cards), including two new plots—one neutral and one loyal to House Tyrell. 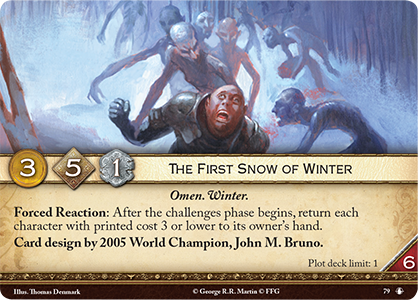 Enhance your deck with iconic characters and locations like Bronn, The Eyrie, and Mirri Maz Duur, and choose your moment to strike in the ever-changing game of thrones. Even as the Great Houses engage in their twisting political dealings and battles to the north, House Martell plots vengeance for sins long past. 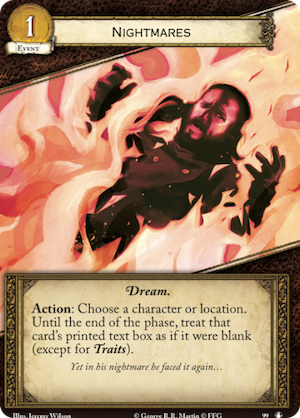 In A Game of Thrones: The Card Game, the Martells commonly prefer to bide their time, slowly weakening their opponent and controlling his every move until the time has come to strike. Now, two new Martell cards in Calm over Westeros help you keep control of the game and gain the power you need when the time is right. 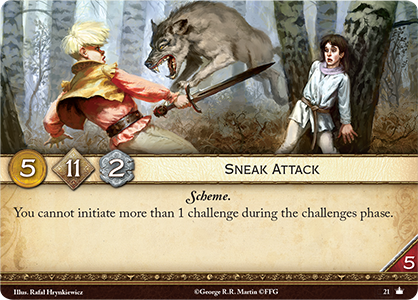 The first card you’ll find is Knights of the Sun (Calm over Westeros, 95). This character offers an efficient cost to STR ratio and a military and a power icon—both of which are welcome among Martell’s typical focus on intrigue. More pertinently, however, Knights of the Sun gains renown as long as you have three or more plot cards in your used pile. 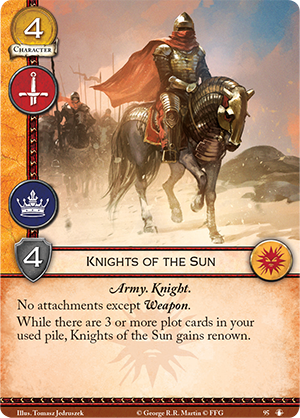 As a relatively cheap source of renown, Knights of the Sun can help close the game, especially since Martell seldom makes its bid for victory until at least three rounds have gone by. When you do close in for the kill, extra instances of renown could make all the difference. It’s also worth noting that Knights of the Sun is at the perfect cost to remain unaffected by The First Snow of Winter (No Middle Ground, 79). 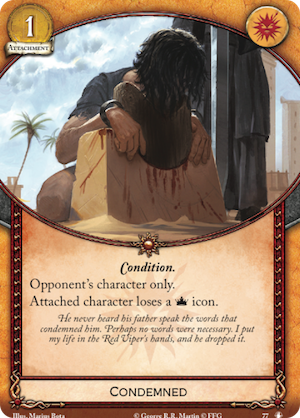 Many of Martell’s most efficient characters can be targeted by The First Snow of Winter, so if your opponent uses this plot to bounce your characters back to your hand, Knights of the Sun can protect your more important characters from military claim. Before you can get to the point where Knights of the Sun gains renown, you must first weather the storm of your opponent attempting to breach your forces and claim victory. 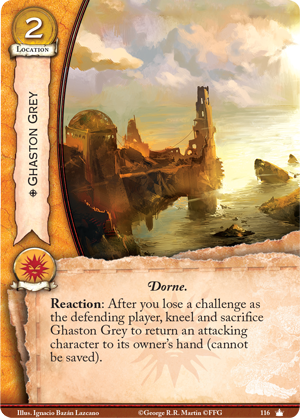 Cards like Ghaston Grey (Core Set, 116), Condemned (No Middle Ground, 77), and Nightmares (Calm over Westeros, 99) are vital to slowing your opponent down, and with the release of Calm over Westeros, you can also use Vengeance for Elia (Calm over Westeros, 96). 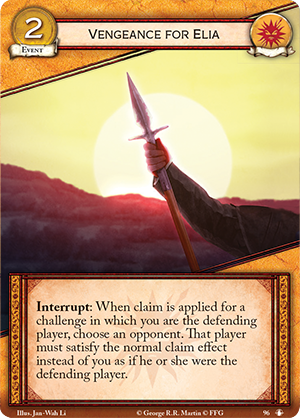 Vengeance for Elia is a two-gold event that reads, “Interrupt: When claim is applied for a challenge in which you are the defending player, choose an opponent. That player must satisfy the normal claim effect instead of you as if he or she were the defending player.” Essentially, Vengeance for Elia serves two important functions: first, it cancels the claim leveled against you, and second, it turns that same claim back against your attacker! You can easily imagine your opponent’s dismay if you turn a Sneak Attack (Core Set, 21) challenge back against him, but even playing Vengeance for Elia on a simple military challenge can create a significant board advantage. It’s important to note that Vengeance for Elia works best against military and intrigue challenges, where satisfying claim forces your opponent to kill his own characters or randomly discard his own cards. For a power challenge, however, your opponent must simply move power from his faction card to his own faction card, instead of moving power from your faction card to his faction card. Vengeance for Elia can still prove useful in this situation though, as it may prevent your opponent from stealing your power to win the game outright! Others may dismiss your patience as laziness or apathy, but when your plans come to fruition, your rivals will rue the day they crossed you. 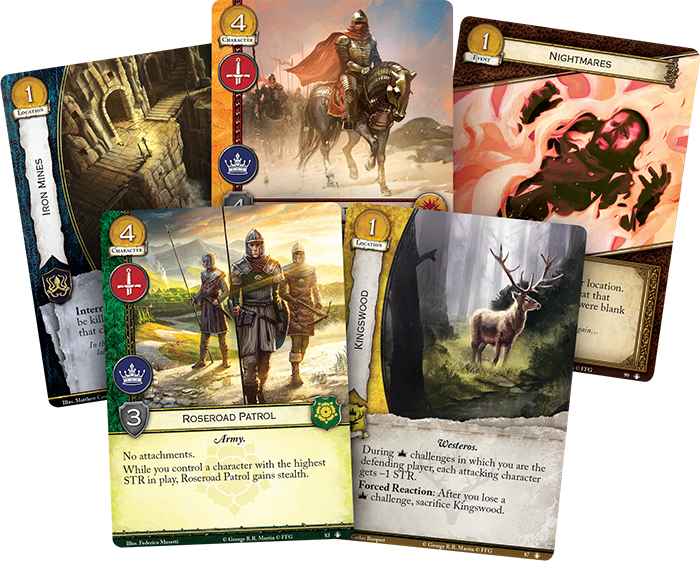 Set the long plan in motion and advance towards the climax of A Game of Thrones with the Calm over Westeros Chapter Pack, now available at your local retailer!